At the start of the 2018-2019 school year, Joseph Kolp returned to high school for the first time in 11 years as Hayes High School’s school resource officer. Kolp, a police officer with the City of Delaware, said that for years, it has been his goal to become a school resource officer. 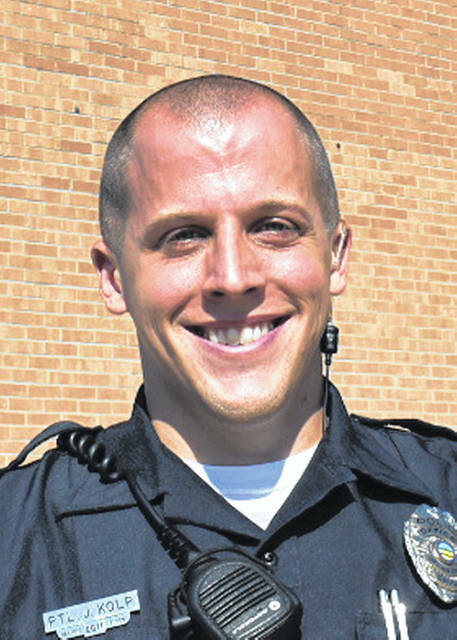 A seven-year veteran with the police department, Kolp said he applied for the position earlier this year after previous School Resource Officer Larry Lucas moved back to road patrol. Kolp added as a school resource officer at Hayes, he performs safety checks, greets students during drop off in the morning, talks to classes, and does safety training for high school staff and students. Kolp said the biggest difference between his previous third-shift patrol position and being a school resource officer is being able to get to know people. Kolp joked that sleeping at night instead of working the late shift has also been an adjustment. As for the staff and students at the high school, Kolp said he’s enjoyed the Hayes community immensely since he started. Kolp said he’s starting to get to know the students. “They are a well-behaved group of kids” Kolp said, before knocking on wood. Kolp, who attended high school in Westerville and graduated in 2007, said Hayes is very different from when he was in high school. Kolp said the students are keeping him busy, but he’s looking forward to what’s ahead.